One Awards offers you the opportunity to accredit the tailor-made courses which you have developed to meet the specific needs of your customers and/or learners. 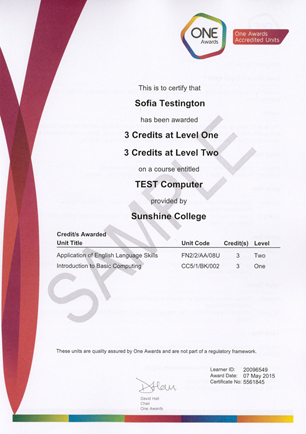 This provides you with a truly bespoke, accredited course. These are credit-based units of assessment which we develop with you and approve for your use. 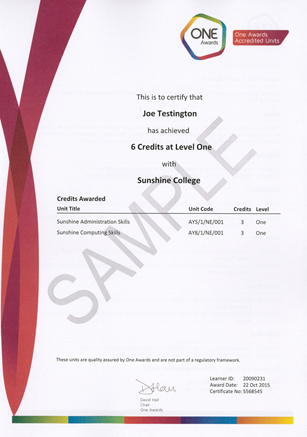 We work with you to write appropriate Learning Outcomes and Assessment Criteria1 or Performance Criteria2 (the unit), based on the content of your course. 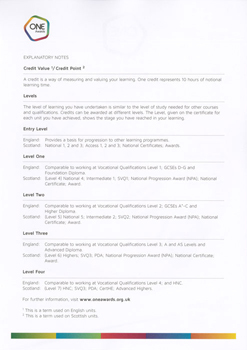 Each unit is benchmarked to a level (Entry to Level 4 in England and Level 1 to Level 7 in Scotland) and assigned a One Awards credit value 1 or credit point 2 – this is the time taken by learners, on average, to meet the requirements of the learning outcomes of the unit. 3 One Awards Accredited units will not be included on any regulatory framework and development is at the discretion of One Awards.